Home Opinion and Editorial What Are You Binging On? 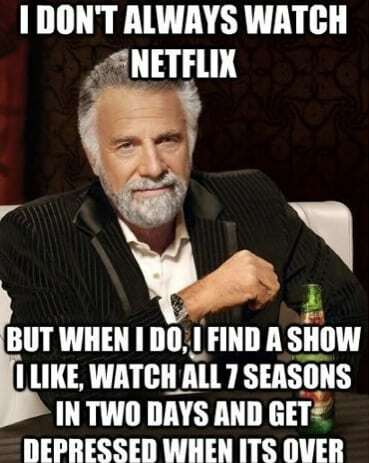 Let’s face it, we all love Netflix and overindulging in a binge session. With the semester finally over, I know you’ll be watching all winter break long! When you’ve finally finished that last season of your favorite show, there will be a dull empty feeling inside. Don’t worry; it’s normal. I’m here to help you fill the void with a list of great shows you should take a wack at! Friday Night Lights: Five seasons for the small town Texas football lover in you. Watch head coach, Eric Taylor take his boys to states. If you aren’t into sports, then watch it for Tim Riggins. Super hot, super lovable. If you don’t love Friday Night Lights by the end of episode one, I shun you. Grey’s Anatomy: 10 seasons to watch intern Meredith Grey and her friends grow into surgeons. Grey’s is the perfect binge watching show. You fall in love with the relationships and all of the drama. Scandal: Another Shonda Rhimes classic. Three seasons of corruption and power in Washington. Olivia Pope will turn into your go-to-girl in no time. Her badass problem solving will leave you begging for more. Sons of Anarchy: Six seasons of Charlie Hunnam and his motorcycle gang kicking the asses of rival biker gangs. He’s hot, so it’s a must watch. Gilmore Girls: You loved it once and you’ll love it again. Seven heart-warming seasons of mother daughter love. You’ll laugh and cry through the relationships, breakups, and binge eating of Lorelei and Rory. Once Upon A Time: Three seasons of fantasy. The residents of a small fictional town in Maine are actually characters from various fairy tales. Very cute and a fun watch. Well there you have it. Six shows to get started with this winter break. Let us know what you think! What should people be watching? Comment below with your favorites.